If you are looking for some cute and casual kurtis for work wear, then look no further than New Thippasandra’s Roshni Boutique. Prices start as low as INR 495 and they have cute prints too. Roshni, a designer from Kolkata has set up a tiny little boutique, just off Indiranagar’s 80 Feet Road. Neatly stacked squares of bright and colourful kurtas for women greet you when you step into the showroom. What do they sell here? 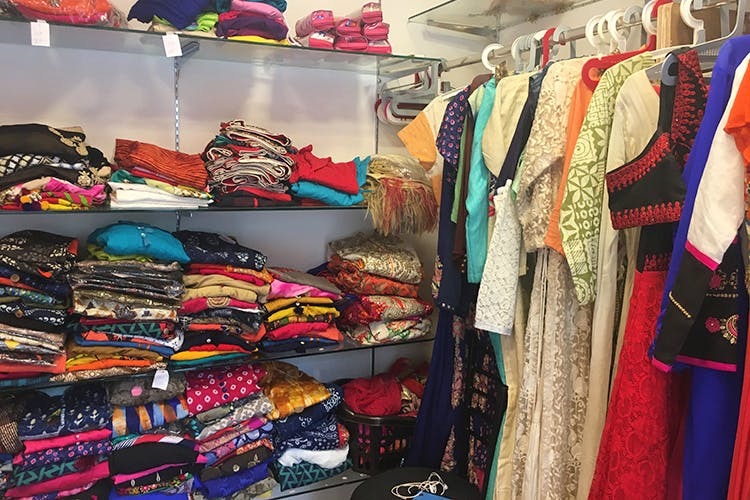 Indo-Western kurtas (which you could easily wear with jeans or even as dresses) of different prints and patterns in cottons, georgettes and chiffons. Prices start at just INR 495 (not including GST) and go upwards. With a lot of designs to choose from, you’ll have to keep your eyes peeled for the more unique gems. Pastels, quirky prints, and kurtas with self-work, pom-poms, and subtle embellishments, the sizes start at S (38) and go up till 5XL (55). They can make an XS (36) on order as well. Swing by this boutique on an easy day, and sift through their clothes. We’re sure you’ll find something that’ll make both you and your wallet very happy. If you are interested in looking at a larger range of designs or buying in wholesale, you can visit their studio just a few buildings away, on appointment.